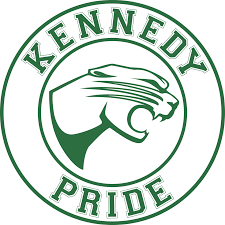 The Maker Space at Kennedy Middle School, run by technology teacher and coach Kathryn Marinos, is a wonderful place for students to explore hands-on learning in Technology, Robotics, and Journalism classes, and Robotics and Maker Space clubs. 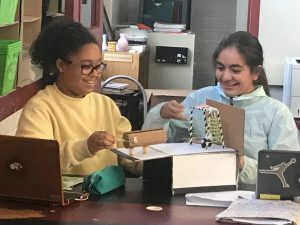 Students in the Journalism/Yearbook class use the Maker Space to create lasting memories for the entire school to enjoy. 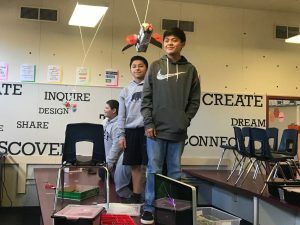 Those in the Robotics and Technology electives use the Maker Space and donated items to explore building robots or taking computers apart to figure out how they work. The Maker Space is even open for students to use in conjunction with other classes. The green screen is a popular tool for creating video presentations for science and social studies assignments. 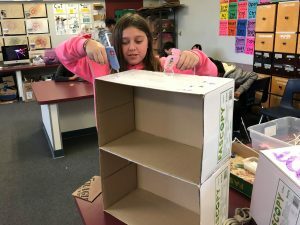 Students can come to the Maker Space at lunch on Maker Mondays to explore their creative pursuits. 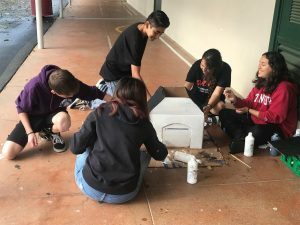 This type of student-led investigation strengthens critical thinking skills that are so important to 21st Century learning. Supplies are generously donated by parents and community members. 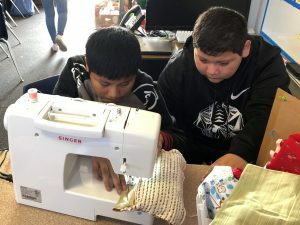 From glue guns to ziploc bags to batteries to sewing supplies, the Maker Space hums along on the power of upcycling unused household items that students use to create and learn. An important addition to the Maker Space will be the addition of a laser cutter. A laser cutter is able to engrave a wide range of materials including plastic, wood, plywood, leather, glass, acrylic, and more. 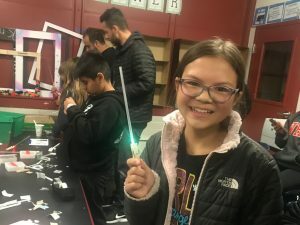 The laser cutter can be funded by the PTO with help from your generous donation and will be a long lasting tool that will add value to students for years to come.